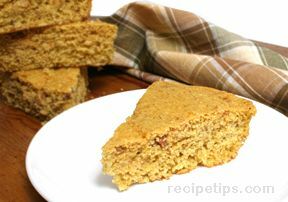 A moist and flavorful cornbread that goes well with soups and stews. In a medium sized skillet, cook bacon until crisp. Remove bacon from the drippings with a slotted spoon. Set drippings aside. Place bacon on a towel lined plate to drain. In a large bowl, mix together the cornmeal, flour, baking powder, sugar, baking soda and salt. In a seperate bowl, beat the eggs with a whisk until foamy. Add the milk mixture to the dry ingredients and stir just until combined. Fold in the bacon bits, chile and chives. Place 1 tablespoon of the bacon drippings in the bottom of a 9 inch round cake pan with 2 inch sides. Make sure the drippings cover the bottom of the pan. Pour batter into the pan and bake for 20-25 minutes. 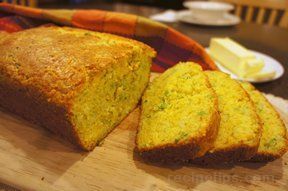 "A great variation of classic corn bread...loved it." 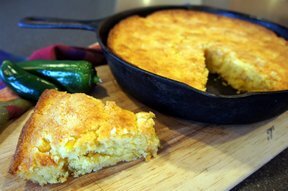 "moist, as you wouldn't expect cornbread to be, but I loved the 'hot' flavor, so did my husband." 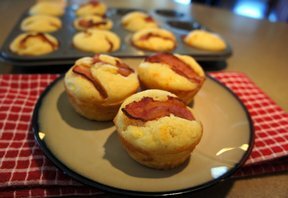 "This is a really nice twist to a traditional cornbread. The chipotle chile give it a little kick."